When people think of martial arts they think of men and women wearing white uniforms and colored belts. This would have never happened if Judo did not come into existence. All of the uniforms that modern martial arts utilize owe their existence to the Judo gi. That’s right – the Judo gi is the grandfather of the modern martial arts uniform. Every time you see someone wearing the iconic white jacket, loose pants, and colored belt you have to give a silent wave of gratitude to Judo for inventing the idea. Judo gave birth to it all. It was also Judo that introduced the concept of colored belts. These days, just about every martial arts from Karate to Krav Maga use colored belts to identify the skill, rank, and experience of a practitioner. Where did it all come from and what is the standard system used today? Jigoro Kano is considered the founder of today’s Judo – also known as traditional Japanese Jiu Jitsu. He first studied several branches of jujutsu before he finally opened his own school and named his art as Judo, partially because the word jujutsu did not fully explain the essence of his new style. In many ways Judo shares a common ancestry with Aikido, which gets its history from the style known as Daito-ryu-aiki-jujutsu. However, Judo focuses more on takedowns, grapples, and submissions while Aikido still incorporates several striking stances and counters. Because of the focus on grapples, Jigoro Kano wanted to focus on a uniform that could help his students easily grab each other and throw each other. The uniform had to be thick so that the fabric wouldn’t rip, it had to be tight enough to give freedom of movement but it had to be loose enough so that students could grab each other. Initially, he followed the footsteps of his instructors and used the traditional Japanese kimono. However, the kimono did not meet the three requirements stated above. Hence he altered the kimono to be thicker, heavier, and a bit tighter but still loose enough to grab onto, and also sported shorter sleeves and pants. The pants dropped only to the ankles and the arm sleeves stopped just above the wrist. This would then become the traditional Judo gi (or Judogi) that is seen today. The Judo gi is slightly different when compared to the gi of Karate. Karate focuses primarily on striking so the uniform has to be light. Judo is more on grappling so the fabric has to be heavier and thicker so that it doesn’t tear when the wearer is being thrown down or lifted off the ground. The sleeves are also slightly longer when compared to the gi used in Aikido or Karate. This is because there has to be ample fabric for the opponents to grab each other. 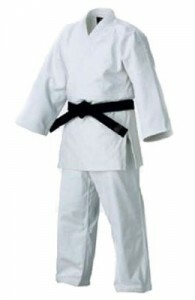 The Judo gi comes in only three colors – white, black, and blue. However, in many schools blue is not an accepted color. Many prefer to go back to the traditional white and black that Jigoro Kano introduced when he opened the Kodokan body of Judo in Japan. Some people argue that this focus on the uniforms renders Judo impractical when used in the real world. However, Judo instructors also teach their students how to alter their grabs and counters so that they may be performed even when the opponent is not wearing a gi. Back when Jigoro Kano was still starting, he introduced the concept of two colored belts. First there were the white belts (kyu or grades) and the black belts (dan or degree). There were also light blue belts that indicated the very basic kyu or 6th kyu. It is important to note that no one in the history of Judo has ever reached the 11th and 12th dan. None of the original students of Jigoro Kano have ever gone above the 10th dan, even in other Judo organizations such as the IJF and USA Judo. Jigoro Kano did state that reaching the degrees above 10th dan were not impossible. Before his death he had stated that if a person truly deserved the promotion and had mastered the arts of the 10th dan then there would be no reason to not promote him or her to the 11th dan. You can learn more about Judo belts and belt colors here.